Every year hundreds of 4WD enthusiasts set off from Cairns and Cooktown for the long trek to Cape York. It is one of Australia’s classic adventure drives. The journey follows the tracks formed by tough pioneers who built the overland Telegraph line in the 1880’s. It’s a very remote and rough track that should only be attempted by experienced 4WD enthusiasts with practical experience in winching and digging out stranded vehicles. The best plan is to travel in convoy with two or more vehicles for mutual support. The road conditions on the Cape route are always a challenge, as they vary from smooth gravel to soft sand, rock-strewn surfaces and long, corrugated sections. Having negotiated these modest hazards the real test is water, either in the form of shallow floodplain lakes due to unseasonal downpours or deep and difficult creek crossings. The essential factor in a Cape York trip is to be fully prepared for any contingency. Before moving on to the next destination, it pays to obtain expert advice on the route from park rangers, local residents and other travellers. A detailed map showing principal side roads to coastal settlements and to national parks is imperative, as much of the enjoyment of this trip is exploring side tracks. Do carry a first aid kit and more than enough food and water. It is ironic that water should be a problem given the countless creek crossings on this journey, but late in the dry season water can be scarce along the main north track. Your vehicle needs to be in good condition and ample spares, tools and recovery gear are required. 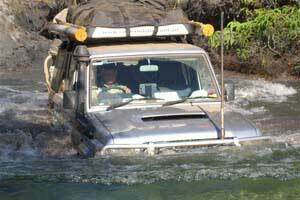 There should be few problems along the main route to Weipa, as it is well maintained for mining company vehicles. From Weipa Junction north it is a different story, as soft spots and corrugations are more evident. 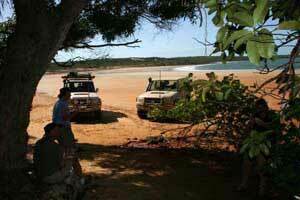 The best time to make the Cape York trip is early in the dry season, around the beginning of June. There is less traffic on the roads and the gravel surfaces are not so badly cut up. Early rains can come in October, therefore it is important to have completed your journey by then. It is a marvellous adventure with enough challenge for any 4WD enthusiast, so it makes good sense to reduce risks and thus maximise the enjoyment.